김미예, 임지영, 그레이스정,(2012).다문화가정 아동의 언어능력과 부모-자녀 응집성이 자아존중감 및 문화적응에 미치는 영향.대한간호과학회지,42(6),879-888. Purpose: There is evidence that parent-child cohesion is a potentially influential factor in children"s self-esteem and acculturation. However, no research to date has examined cohesion with parents as a potential pathway between Korean proficiency and self-esteem or acculturation among children from multicultural families. 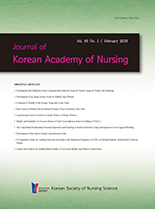 This study was done to address these limitations by examining whether and to what extent cohesion with parents mediated the effect of Korean proficiency on self-esteem and acculturation among children from multicultural families. Methods: Data were collected from a sample of 138 mothers and their children living in Seoul, Daegu, Kyungi province, and Kyungpook province. Multiple regression analysis was used to examine the relationships between the variables of interest. Mediation effects of cohesion with parents were tested by following the procedure recommended by Baron and Kenny (1986). Results: Cohesion with parents partially mediated the relationship between Korean proficiency and self-esteem. For children"s acculturation, the effect of Korean proficiency was partially mediated through father-child cohesion. Mother-child cohesion completely mediated the relationship between Korean proficiency and acculturation. Conclusion: These findings suggest that to help children from multicultural families experiencing difficulties with self-esteem or acculturation, it might be useful to develop programs that are aimed at strengthen cohesion with parents.